Our "Ma Bean" and "Nana Bean" to her grandchildren, would like you to know her work here is done. She received her calling on Sunday, March 24th. She was a pillar of light with unwavering faith - an angel here on earth. Born July 30, 1931 to Persis and Hazen Purrington of Colebrook, NH, Edna graduated from Colebrook Academy and worked many jobs through her early years. Her most fulfilling job was becoming the wife of Van Ness Bean Jr. and the mother of four children which grew into 19 grandchildren and two great-great grandchildren. A legacy that will endure the test of time. 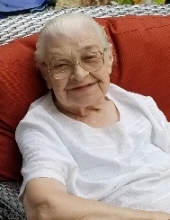 Edna was a founding member of the Gateway Pentecostal Church where she practiced and shared her faith serving our Lord and Savior in any manner she could. Predeceased by her husband, Van Ness; her son Robert "Bobby" Bean; her brothers Lynwood, Wilma "Tim" and Edward Purrington and sisters Hazel Goodrum and Evelyn Whiting, all from the Colebrook area. She is survived by Randall Bean of Oakland, Patsy Penney and husband Kenneth of Burnham, Vanessa Bean of Burnham and special son and daughter-in-law Steve and Debbie Lucas of Sidney. A memorial service will be held at the Gateway Pentecostal Church, 363 Moosehead Trail, Newport on Saturday, April 6 at 10 a.m. followed by a reception at the Palmyra Town Hall. In lieu of flowers, donations may be made to the church or a local humane society. To send flowers or a remembrance gift to the family of Edna L. Bean, please visit our Tribute Store. "Email Address" would like to share the life celebration of Edna L. Bean. Click on the "link" to go to share a favorite memory or leave a condolence message for the family.